Part of the fun of having children is getting to act like a child again and spend hours exploring together outside. 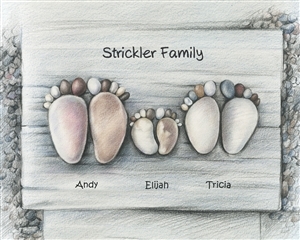 This color pencil print is a great reminder of all of those barefoot memories that you made with your little ones while walking along the nature trails behind your home. No matter how big your children get, you'll always remember how cute those little feet were. Personalize this artwork with names and your own sayings to make a sweet gift for a friend or new family that you love and care for! A myDaVinci exclusive as always. Personalization: Two lines maximum for top writing section and one line for the name sections on the bottom.